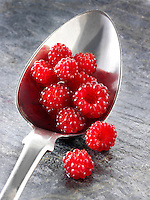 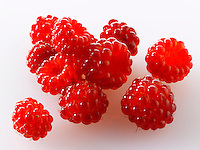 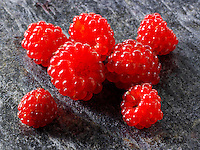 Fresh organic Wineberry food pictures, photos & images. 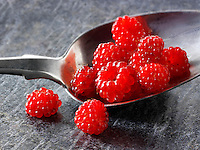 Rubus phoenicolasius (Japanese Wineberry, Wineberry, or Wine Raspberry) is a species of raspberry (Rubus subgenus Idaeobatus) native to northern China, Japan, and Korea. 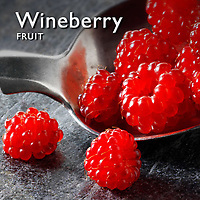 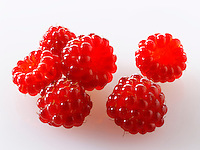 The fruit is orange or red, about 1 cm diameter, edible, produced in summer or early autumn; in botanical terminology, it is not a berry at all, but an aggregate fruit of numerous drupelets around a central core. 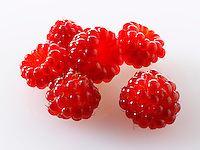 Ripening occurs from early summer.